» Does this look like a swamp? Does this look like a swamp? If there’s evidence of hydric soils, I didn’t see it under all that bark. You’re looking at the playground in Albany’s Sunrise Park. But it’s more than that. It’s also an exhibit in the story of how bureaucracy expands when it’s allowed to distort a well-intended law. For at least three years, Albany has intended to restore Sunrise Park. In 2013 it announced its intention to use federal antipoverty money to help pay for the project because the park, just south of Sunrise School, is in one of the city’s poorest census tracts. 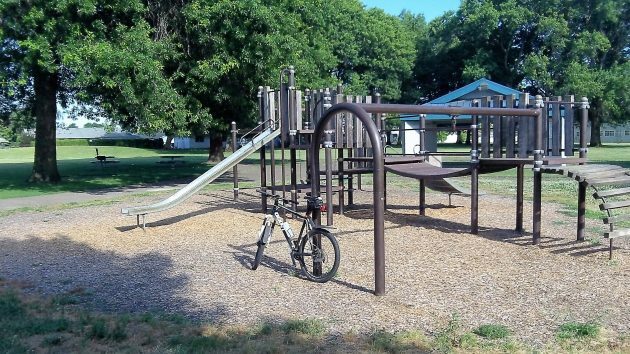 But so far, this project to improve the lives of residents by making the park safer, more fun to use and less prone to vandalism has been held up. The reason for the delay: Roughly half of the 3.16-acre park, including the playground area covered by a layer of bark mulch, has been designated as a “wetland” under the state’s definition. Like any level piece of ground in the Willamette Valley, part of the park probably collects a little rainwater in the winter and gets soggy enough to develop “hydric soil.” Under state rules the presence of such soils is one of the indicators that a wetland exists. The city wants to establish a small parking area that would make the park easier for residents to reach and police to patrol. It also wants to replace and move the playground, judged to be out of date, and to make other improvements. It can’t do any of those things until it gets a permit from the Department of State Lands. The parks department could avoid the wetland issue if it changed its plans, but that would mean giving up to best way to meet the goal, which is a better and safer park for the neighborhood. The state is acting under a law (ORS 196.795-990), which requires people to get a permit if they “plan to remove or fill materials in waters of the state.” There is no water in Sunrise Park, just as there is no water on the police site. So what’s the deal? The deal is that over time, the intent of the law has been turned upside down. In these cases it now deals not with water but with land. The state explains: “The purpose of the law, enacted in 1967, is to protect public navigation, fisheries and recreational uses of the waters.” If that was the purpose, and it was a good one, where does the department get off declaring that “‘waters of the state’ include wetlands on private and public land.” Especially when those alleged wetlands have no bearing on navigation, fisheries and water sports? Albany and everybody else goes along with this charade because while it’s expensive, it’s less expensive than a prolonged court fight that challengers might well lose, knowing how deferential our courts have become to edicts of the administrative state. This is just another example of out of control government, that needs to be reined in. To quote Linus Van Pelt, “I weep for our generation”. Maybe now we need not put quotes around the word. but Hasso frequently agrees with the over-reach if it suits his fancy. I would like to see more pushback against all over-reach. That would bring out the label of “he’s the guy who always says no.” Takes a thick skin. Thank you to Mr. Cordier for that “thick skin.” It takes courage. I wonder how much of the area that is “purchased” for wetlands credit meets the criteria for WETLANDS? The real problem lies with the EPA and other federal, state and local agencies changing and expanding the scope and intent of original law (as Hasso pointed out). Bureaucracies (a subset of institutions) have only one purpose: to grow. Otherwise, they die. And we can’t have that, can we? Courageous judges would throw out assumed jurisdiction where it was clearly never intended to be, but progressive thinking require expansion of government control over all aspects of our lives. A more conservative populace demanding change would correct this. Glad to see another Charles Schulz fan here, Tony. Just another example of the “progress” we’ve made under the leadership of the Democrat/Progressives in our state government. People who believe in that ideology have a default position that the “experts” who staff government offices automatically know more than the citizenry. Thus the nanny state rolls on – an unstoppable leviathan that consumes ever more of our money and our freedom. But its ok – because its for our own good, don’t you know. So why use gears when you have a left wing echo chamber to tell you what to think? See how it works? You make some talking-points, ad hominem comments to attack someones credibility because you have no logical or reasonable thoughts on which to base a rational discussion. And btw: you forgot to throw in an accusation of raaaacism which is de riguer with lefties these days. Honestly, I’ve grown numb to the “raaaacism” call. It exists. We all heard it +8 years ago when President Barack Obama was running for the highest office in the land. Some have heard it their entire lives. Now, it’s stronger than ever. No, the new theme is Xenophobia. Catch up. A definition: A person who is fearful or contemptuous of that which is foreign, especially of strangers or of people from different countries. Good to see the Republican party graduate to Trump. You just did it again. You need to look up “ad hominem” and then try to avoid practicing it. I can say you are the racist but it has no more credibility than your blanket slandering of all conservatives and Republicans. You would do better to avoid showing your own bigotry thus acquiring more credibility. Until you do you are no better than any other biased bigot. I am not aware of anything I’ve typed that has attacked any other commenters personal traits. However, I am successful if I motivate a single mind to consider other sides or a different framing on these topics of interest. Then I have undermined an argument and should strive for more than just one. Possibly another definition of ad hominem I am missing.